One of the most curious aspects of the FOMC’s apparent rush to end its “accommodation” is the distinct lack of any market-based reinforcement. Using only statistical analysis of economic accounts, the Fed is, in effect, saying that it is ignoring all market indications contrary to its main assessment. That extends not just to overall economic measures but also, referring to its primary mandate (supposedly), setting aside its preferred metrics for “inflation.” The PCE deflator has remained under the Fed’s own target for almost three years and the 5-year/5-year forward calculation is saying that is not going to improve any time soon. The treasury yield curve is the most prominent market-based signal because modern finance forms its rational basis out of premiums inferred from it. That includes especially term premium, also known as time value. In an economic context, term premiums can tell us a lot about relative “demand” for “money” (really credit) and thus an indirect though market-based measure of future expectations for economic growth and monetary variability. 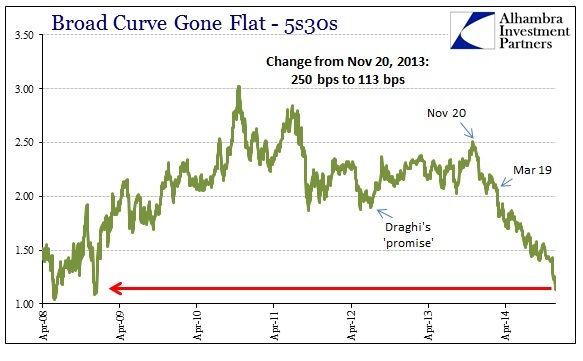 The most prominent example of that visibility is when the treasury curve inverts. Yield curve inversions are highly indicative of recessions in the near future. Again, that makes sense in the context of term premiums and time value – if there is negative term premium down the curve than in comparison with shorter term interest rates, then it would make sense that credit market investors are highly concerned about future opportunities for “money” (really credit). There have been numerous “studies” published regarding curve inversion, though they usually amount to some regression trying to measure predictability in a normal distribution format. FRBNY features one in particular that normalizes the spread between the 3-month T-bill and the 10-year Note to forecast one-year forward. In other words, based on historical data as a starting point (normal distribution assumption) the inversion of the yield curve at the 3m10s offers a statistical prediction variable. As is plain in the chart above, the model worked quite well during the 1970’s, though the timing of the forecasting was skewed in places. 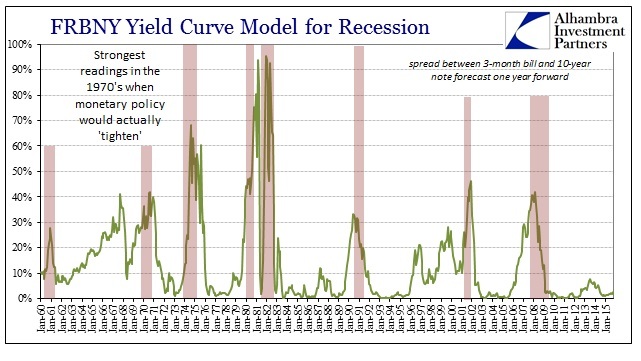 When the 1981-82 recession began in July 1981, the yield curve spread in July 1980 (fed through this statistical model) only predicted a 4.08% chance of recession. By December 1980, the model was correct in predicting a 95.41% chance of recession in December 1981. So clearly, timing is itself another variable. The reduced recession probabilities after 1980, however, clearly introduce an additional complexity. Whereas recessions before 1983 were often preceded by FOMC “tightening” to inadequately deal with consumer inflation, in the age of interest rate targeting after 1987 the FOMC has only done the opposite. That means that at the onset of recession the yield spread especially using the 3-month bill as an anchor for short-term expectations is highly connected to that policy direction rather than any “market-based” information about premiums. In other words, the 3-month rate may be (almost assuredly) too artificially influenced. It becomes particularly acute at the beginning of the Great Recession and thereafter as the Fed purposefully engineered a course to ZIRP. 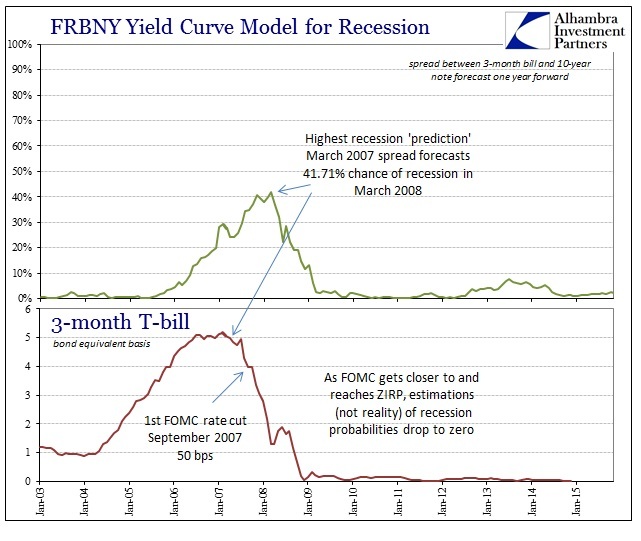 FRBNY’s model at its “best” with spreads from March 2007 only predicted a 41.71% chance of recession in March 2008. Thereafter, the probabilities declined to zero exactly when the worst case became reality. If there was great predictability here, like that in the last half of the Great Inflation, you would expect a reasonably high reading predicting the economy falling off a cliff starting in mid-2008. 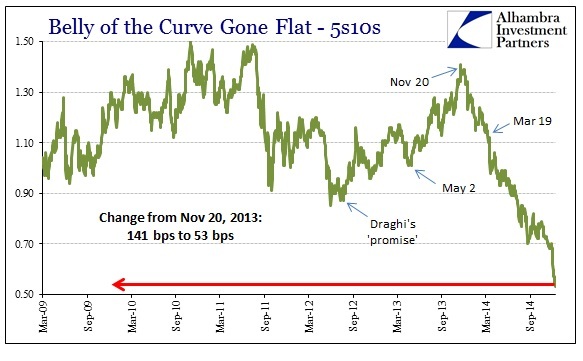 The fact that the yield curve failed in that regard is not about the time value of money so much as it is policy interference in setting that factor. The NBER defines a recession as “a significant decline in economic activity spread across the economy, lasting more than a few months, normally visible in real GDP, real income, employment, industrial production, and wholesale-retail sales. The focus on a “decline” may suggest that we should look at changes in leading indicators—rather than levels—to assess the health of the economy. In the case of the yield curve indicator, however, the level of the term spread provides the most accurate signal of a forthcoming recession. One reason for the superiority of this measure is that, conceptually, the level of the spread already corresponds to a forward-looking expected change in interest rates. By looking at relative changes, the yield curve becomes unanchored by policy interaction at the short end. 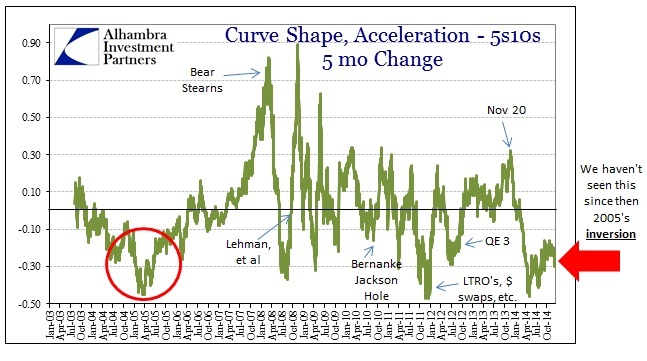 Therefore, in contrast to the author’s assertion about the “level” of the curve spread, there is potentially far more uninfluenced information in changes in the yield curve shape rather than its ultimate disposition nominally. That is especially true at a sustained incidence of the zero lower bound as repression of “forward-looking” expectations by definition invalidates them as an expectation of anything other than what the central bank might do. And thus there is the ability to use the yield curve beyond the 3m10s, providing potentially a more robust set of credit-based signals. That brings us to the current condition. The FOMC is adhering exclusively to its models which are in direct contradiction to credit markets. Rather than “review the assumptions and relationships” the Fed is going to listen only to mathematical creations that have a more than dubious track record in this exact area. The yield curve out and away from ZIRP and persistent monetary repression (that began in September 2007 when these same models “forecast” a zero lower bound event of 4-quarters as essentially impossible; for the record, the FOMC has been at the ZLB for eighteen quarters now and still going) is making relative movements that should at the very least cause significant pause in terms of yielding policy to flawed and dubious statistical models (though ultimately I have little interest in the FOMC’s policy positions other than a total prohibition from discretion); and certainly should remove a great deal of the professed confidence in the current economic circumstances and those at least one-year forward.